Jimmy Kimmel is doing something a little different this week and is broadcasting his late night television show from New York City at the Brooklyn Academy of Music's Howard Gilman Opera House as part of his "back to Brooklyn" week. To help kick off the week’s first show, Kimmel decided to invite Eminem to serve as the musical guest, who went on to perform his Kamikaze song “Venom." 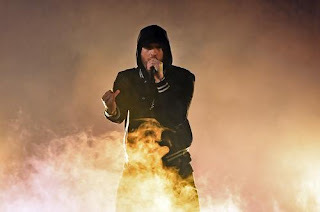 Rather than taking the stage next to Kimmel however, Em performed his song at the top of the Empire State Building while a chopper circled over head. The performance was presented by Google’s new Pixel 3 phone, and was surprisingly taped using just the phone as well, or most of the performance anyways. In addition to the performance, there’s also a comedic interlude where he revealed facts about the Empire State Building’s construction to Kimmel’s hilarious sidekick Guillermo Rodriguez. Check out the lengthy, 8-minute performance (below) and look for more special guests on Kimmel later this week. Cardi B is a “special” guest (not musical) on Wednesday, meanwhile the Wu-Tang Clan is scheduled to be the musical guest on Friday. Set your DVR’s now.